Oleg Deripaska (left) has issued a statement decrying a text and YouTube broadcast published last week which allege improprieties on a fishing trip off the Norwegian coast when Deripaska hosted Sergei Prikhodko (right). The trip occurred in August 2016. At the time, Prikhodko was Deputy Prime Minister and head of the government staff under Prime Minister Dmitry Medvedev. 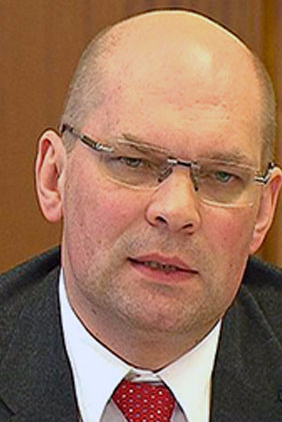 Prikhodko, 61, started a career in the Soviet Foreign Ministry in 1981. He then transferred to the Kremlin where he has been a Kremlin staff assistant to Presidents Boris Yeltsin, Vladimir Putin and Medvedev. Prikhodko remains in his post until a new government is appointed following the presidential election on March 18. “I will severely suppress any attempts to create and disseminate false information flow,” Deripaska has announced. The broadcast about Prikhodko’s fishing trip with Deripaska first appeared on February 8. Since then it has drawn to date 4.8 million views. Source: https://www.instagram.com/p/Be-C457FDil/?taken-by=oleg.deripaska Deripaska has compiled a record in the Moscow city court, and in the files of the US State Department, FBI and CIA of what he means by “severely suppress” investigations of his business practices. For that record, start here. A total of 2,685 viewers have been logged as approving Deripaska’s message. His reference to “a group of people [and] a planned campaign aiming to damage my reputation” has stimulated speculation in Russian business and media about this group’s identity. Insiders at the Russian aluminium monopoly Rusal, which Deripaska controls, say they don’t believe the disclosures were prompted by disgruntled Deripaska family members or Rusal shareholders. Last year Deripaska tested his reputation in a federal Washington, DC, court, against publications he called false and libelous by reporters of the US news agency, Associated Press. His lawsuit was dismissed on October 17 without trial, in a summary judgement by federal judge Ellen Segal Huvelle. The story can be read here. Huvelle ruled that even if publications about Deripaska turn out to be unproven or false, he is such a notorious public figure he cannot prove defamation without meeting the US legal standard of “actual malice; that is, with knowledge that it was false or with reckless disregard of whether it was false or not.” Read the 21-page judgement on Deripaska’s reputation here. In his public responses, Prikhodko has not claimed the reported details of his fishing trip with Deripaska were either false or defamatory. “By and large it is advisable to answer this, man to man (по-мужски),” Prikhodko told RBC. Alexei Navalny, author of the report, is a “political loser [who] has once again tried to arrange a provocation and to remind of himself, having chaotically mixed everything that’s possible and impossible — from my friend [Oleg Deripaska] to the American president Trump and the [person] unknown to me personally, [Paul] Manafort.” Prikkhodko said he wouldn’t sue Navalny to avoid giving him “too much dignity”, and would leave the litigating to Deripaska. Russian press reporting has confirmed there have been investigations in the past into the match between Prikhodko’s income as a state official and the affluence of his assets and lifestyle. The official findings rule out a discrepancy. According to Oleg Plokhoi (right), head of the Kremlin’s anti-corruption unit (until last September), “the analysis of the specified positions demonstrates that income which is officially earned by government employees is sufficient for the acquisition and maintenance of country real estate by them. In this regard, the bases for a conclusion about a discrepancy between their income and expenses aren’t available”. The election which will decide Prikhodko’s future is just over a month away. Dmitry Peskov, spokesman for the frontrunner President Vladimir Putin, was asked this week by reporters to comment on the reported relationship between Deripaska and Prikhodko. “No, I couldn’t and wouldn’t like to do it,” he responded. Opposing Putin, seven candidates have been officially registered for the March 18 election. 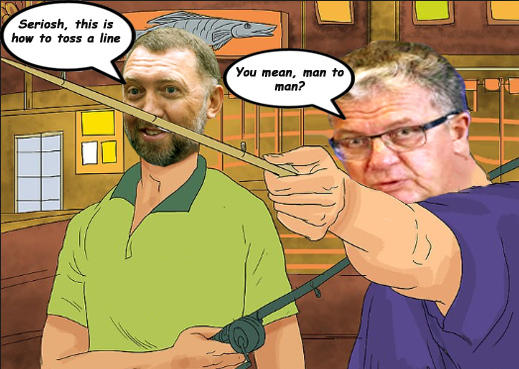 The number of those who have now watched the fishing trip broadcast is already greater than the number of votes Vladimir Zhirinovsky won in the 2012 presidential ballot, when he placed fourth with 4.5 million votes. The YouTube view number is approaching the 2012 vote for Mikhail Prokhorov, who came third in the election with 5.7 million. Each of the opposition candidates in this year’s race has been asked the question: What political significance do you think the disclosures of the relationship between Sergei Prikhodko and Oleg Deripaska should have for Russian voters? All but two – Grigory Yavlinsky and Sergei Baburin — refused to answer. Pavel Grudinin for the Communist Party refused to answer by telephone, and requested an email without promising to reply by publication deadline. Vladimir Zhirinovsky for the Liberal Democratic Party refused to answer by telephone, and requested an email without promising to reply by publication deadline. Ksenia Sobchak for Civil Initiative refused to answer by telephone, and requested an email without promising to reply by publication deadline. Maxim Suraikin for Communists of Russia refused to answer by telephone, and requested an email without promising to reply by publication deadline.